Works with 3CX, Avaya, Broadsoft, Cisco, NEC, Mitel and 30 More ! For certain buildings and End Users, it’s important to have a device that can contact people in the event of an Emergency. Front of house reception areas are the probably the most popular. An IP based Panic Button could be easily mounted under the desk. If a situation of duress occurred, the user could press the button. This then places a call to a pre set number or call group. A pre recorded message up to 80 seconds long will play. Yes we have our desk IP Phone and Mobile to make calls, but in a duress situation, the intruder would not allow you to pick up your IP Telephone and make a call. The IP Phone Panic Button is mounted discreetly. It can be activated quickly, without anyone knowing. In this post we are going to look at the features of the IP Panic Button. We are going to explain how easy it is to install. Most importantly, we are going to show you how it integrates to your IP-PBX. The device is specifically made for VoIP platforms, using the SIP Protocol RFC 3261. The IP based VoIP Panic button features a metal back plate. You can see an example in the picture below. Simply screw the backplate to the underneath of your desk. Then attach the main body of the device, back to the frame. Now secure this with 3 small screws. All fittings are included. Before this is done, you need to connect a cat5e or cat6 Ethernet cable to the devices RJ45 port. Then run the cable out of the cable entry slot. The IP Panic Button is Power Over Ethernet enabled. You run the cat5e cable into a spare PoE port on your network switch. You have not connected the IP device to the network it needs to operate. If your on-site network switch (Cisco, D-Link, Netgear) etc is NOT PoE out, then simply use a one port PoE injector. The panic button features an integrated dry relay contact (I/O board).This offers an alternate power input. You do have the option to mains power the device However, you need a data cable for connectivity, it makes sense to use that same data cable for power. PoE adds flexibility and cost savings to the installation. Once you have connected the device to a network point, sit back and relax. You have now completed the hardware installation.The maximum distance you can run cat5e and cat6 is typically 90-100mtrs. With LAN extenders available today, you can run up to 1KM. As this is designed for reception areas, front of house banks etc. In most cases, a network point is usually close by. One of the main reasons we are personally seeing an influx of SIP Panic Button sales, is due to the roll-out of fibre and IP Phone Systems. Even if we don’t understand VoIP, we can not ignore it. New builds now, do not deploy traditional analogue PBX systems. That is just a fact. Then if we look at the market of existing buildings, ones which are upgrading to VoIP. BT are rolling out a multi billion point fibre deployment right now. The demand for security devices that integrate to the IP Phone system is growing each day. We have VoIP based SIP Door Entry Phones. Another popular SIP endpoint, is the Public Address SIP Speaker Systems. Ok, so I think you get the VoIP is big, let’s get back to how we integrating this to a VoIP architecture. First of all, lets clear up SIP. Session Initiation Protocol is the communications protocol for signalling within a VoIP network. If you want learn more on SIP, see this external article here. When we say the IP Based Panic Button is “SIP enabled”. We are saying, it’s adhering to the protocols and standards used for an IP Phone System. The Emergency Panic Button is now connected to the network. It now has its own IP address. You type this into a web-browser. For example, Chrome, Firefox, Internet Explorer or Safari. You have now entered its web-page settings. This is all very simple to achieve. Click on the SIP configuration parameters. Here you will enter the credentials of your SIP server. A SIP server is also known as an IP-PBX. The configuration is noting more technical than entering your SIP Server details. The IP Panic Button is now part of your IP Telephony platform. You can record your own audio call out message. This can be up to 80 seconds long. Upload it and store it to the device. 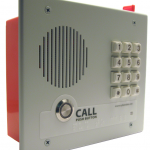 In the event of an emergency, you press the button, a call will be placed to a pre set number. When the phone is answered, the device will play the pre-recorded message. If you dont want to record your own message, you could upload a specific audio file. The VoIP Panic Button is making a telephone. It can all the pre set phone number, you could also form a hunt group with that extension. The above shows you the web page settings. This is accessed through its IP address. Within the “Audio Config” you can upload your own personal audio message. This is played to the person who takes your call. Lets Recap: The SIP enabled IP Panic button easily connects to a spare network point. Its an IP device, so you programme the device through its web-page. Its PoE enabled, therefore you power it with the same Ethernet cable used for it’s connection. Once onto the LAN, register the device to your IP Phone System. Similar to the physical installation, this is all very easy and straight forward. The device is mounted under your desk. Alternatively, you can mount it to a wall. If a situation of duress occurs or you are faced with an intruder, simply press the button. A call will be made and your message will be broadcast. 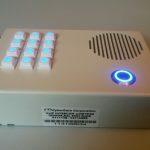 Working on your own Panic Button project, would you like a demo unit ? Manchester based: Specialist distributor of VoIP Secure Entry + VoIP Public Address Systems. All our SIP endpoints set up just like an IP Phone. Register to On-site or Hosted IP-PBX platforms. "Contact Here". CyberData Corporation: Founded in 1974 in California, designs innovative POE & SIP-enabled IP endpoints. CyberData products have an unsurpassed reputation for ease-of-use, reliability, and connectivity. All products are certified by Avaya, Broadsoft and Cisco. Also Digium for Asterisk based systems (since 2007). LG IPECS, NEC, Mitels SIP Centre Of Excellence Team and many more. CyberData OEM for Dell, HP, Fujitsu, Wincor-Nixdorf & APG.